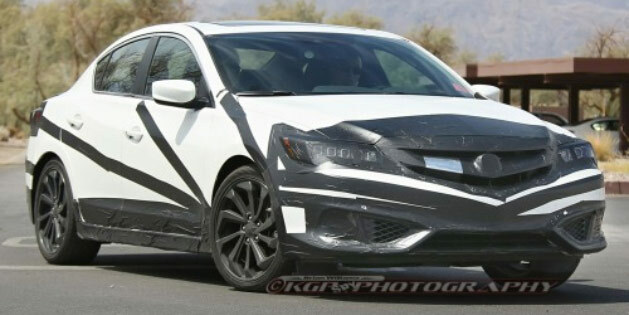 Edmunds.com has posted three photos listed as the 2016 Acura ILX. The images show a partially camouflaged vehicle with definite ILX design cues. Front and rear bumper updates are visible, as well as the addition of Jewel Eye Headlights and a new grille design. This could confirm a shift towards a new grille that was first seen on the Acura Concept SUV-X. Also noted is the use of seemingly wider rear wheels, which might indicate the possibility of an AWD model for 2016. Earlier this year Autoguide.com reported that all Acura models will be getting an all-wheel-drive option by 2016. See the rest of the photos on Edmunds.com – 2016 ILX Sedan Review.